There’s not a lot of sauce though. Just a spoonful per serving. Leaves you wanting more. 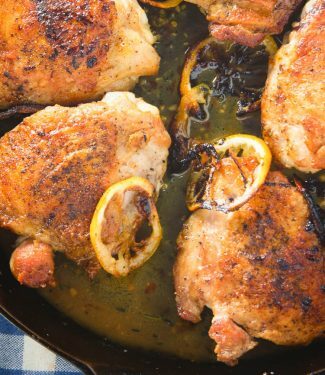 Lemon thyme chicken is fast enough for a weeknight but flashy enough for the weekend. 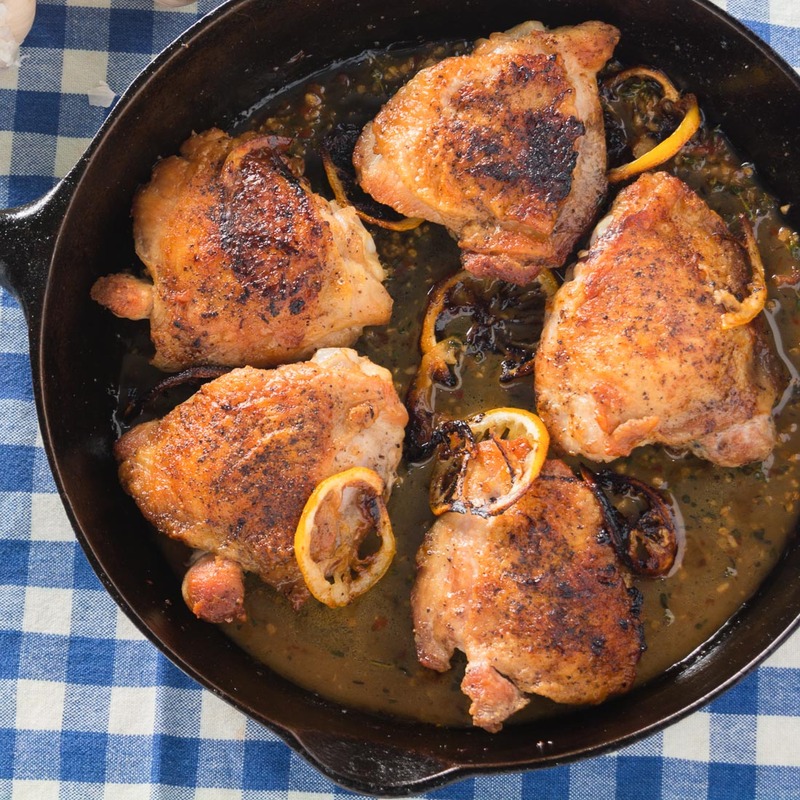 Don't serve the lemon thyme chicken with anything that will soak up the sauce. Roasted potatoes or roasted root vegetables work. Buttered carrots are nice. Green beans maybe. Some baguette on the table maybe so people don't have to lick the plate. Preheat your over to 425F. Rub the chicken thighs with olive oil and season liberally with salt and pepper. Pre-heat a sturdy frying pan to medium and film with a bit more olive oil. Add the chicken, skin side down, and fry for about 10-12 minutes. Keep an eye on the temperature and adjust as necessary to keep it from smoking. You want to hear that frying sound the whole time. By the end, most of the fat from the skin will have rendered and you will be shallow frying the chicken. Remove pan from heat, remove chicken and spoon off all but 1 Tbsp of fat. It's just one Tbsp - it won't kill you. Line the bottom of the pan with the lemon slices and return the chicken to the pan, again, skin side down. Roast at 425 for about 8-10 minutes. You are going for an interim internal temperature of about 155-160F (you have an instant read thermometer right?). Flip the chicken and return to the oven for another 3-5 minutes or until you reach an internal temperature of 175F. This last step isn't necessary but it helps bring back the crisp to the skin. Remove chicken and now caramelized lemon slices. Heat pan over medium low heat and add the garlic and chili flakes. Cook for about 1 minute, stirring constantly. Add the juice of 1/4 lemon and cook another 30 seconds or so. Pour in the white wine and raise heat. Reduce to syrupy glaze. Now, add the chicken stock and thyme. Reduce by a bit less than half. If you have the concentrated chicken stock add it now. Add any accumulated juices from the chicken, mix and adjust seasonings.